Winter on the Frey Ranch has been filled with rain this year. Mendocino County seems to be experiencing a Real Winter after many years of drought; the greens in all hues are vibrantly coloring the landscape of the ranch as the fields, pastures, and hedgerows have taken in water to a full saturation point. Gratefully, the weather has been coming in stormy spurts that allow a proper level of percolation between rainy downpours, and nature's irrigation program has been nearing perfection! In the barnyard, extra rains mean extra worms, and the chickens have been happily foraging each day for the juiciest selections the earth promises to yield. 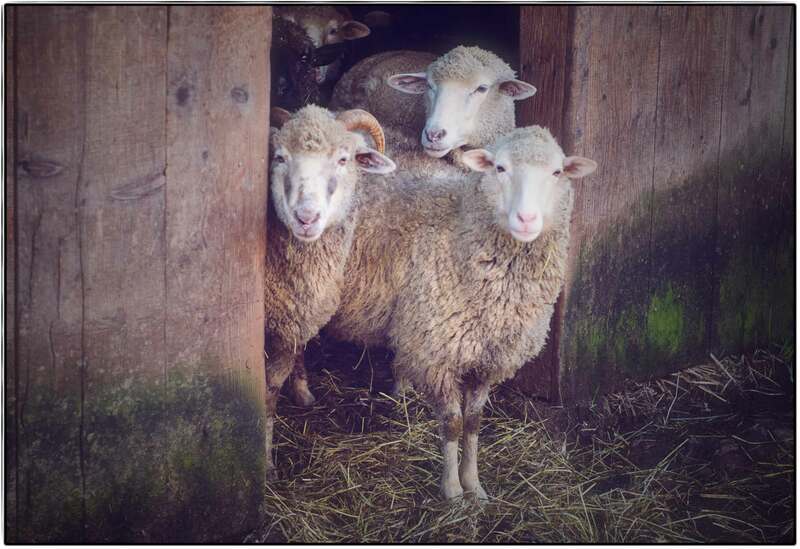 The sheep, goats, and cows all seem to be tolerating the pouring heavens, although I believe that they are more interested in the prospects of delicious fodder in the months to come than the actual rain right now. I was mucking the goat pen the other day: a process which involves gathering the pee and poo-soaked straw into wheelbarrows and bringing the earthy offerings to a pile nearby where compost can commence. We try our best to keep the pens cozy, but the added weather has been better for compost than for barn hospitality I'm afraid. Because our animals get to graze in the vineyard rows at this time of year, they have lots of time to frolic and stretch out their limbs in the great outdoors. Being able to run about on the gravel roads and rocky outcroppings allows them to maintain better foot/hoof health, and they love finding rare treats on their forays. Madrone leaves have been a particular favorite as of late. 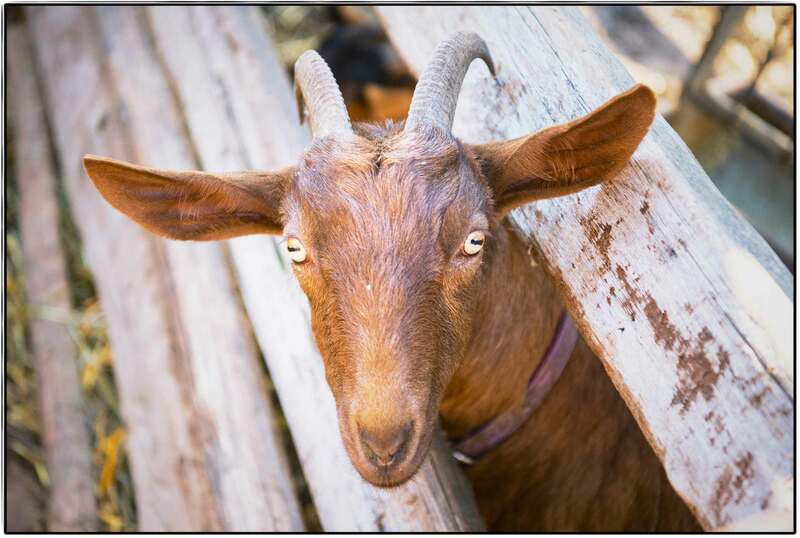 It's a true thing of beauty to be out in the vineyards, watching the goats find edible bites here and there, browsing between wild greens and cover crop legume sprouts. Speaking of the goats, our herd has expanded for the winter. Some dear friends have brought their small herd of pack goats to play with ours for the winter months while they vacation in warmer climes. For those that haven't heard of pack goats, the concept is not unlike using horses, burros, or donkeys to carry the load for walking expeditions. The goats are usually given a modest pack to carry along on hikes; they dine on whatever is fresh and available, so there is no need to bring along food for them. In fact, the ladies offer up fresh milk to the humans, making them ideal companions on the trail. Because our friends’ pack goats like to spend their summers in the Trinity Alps of California's northern wilderness, and are used to lots of exercise, they have been fitting right into our daily walking adventures on the land. Both of their female goats and two of our goats are pregnant and due to kid this spring, when the sun has returned to longer, warmer days. Until then, we're finding the best dry days to muck out the barn and savor extra-long walks among the dormant grape vines. Away in a manger, life smells of summer-cured alfalfa and grass hay. There might even be a tomten tucked up in the rafters, singing songs of sunnier days to the ruminating barnyard. Mariposa Creek is enchanting. It has long been a sanctuary for hikers, and a cool refuge from the summer’s heat. With its low temperatures and persistent summer flow, Mariposa Creek currently hosts a high quality habitat for resident steelhead trout, a salmon species that has been listed as threatened under the Endangered Species Act, and it is likely that it once provided refuge to vibrant Coho salmon as well. Russian River steelhead runs in California once ranked as the third largest, behind the Klamath and Sacramento rivers. During the 1930’s and on through the 1950’s, the Russian River was renowned as one of the world’s finest steelhead rivers, and a healthy economy thrived on fishing activity. Mariposa Creek is a tributary of the west fork of the Russian River, and at their confluence the river’s pools can completely dry up in the summer when streamflows become subsurface below the gravel. For young fish, access to the upper reaches of the watershed where cooler canyons are fed by spring flow is critical for their survival. On the lower portion of Mariposa Creek, two fish passage barriers exist that inhibit migratory fish from accessing upstream habitat to spawn and rear. The first barrier exists at the Tomki Road culvert that was rebuilt in 1972, and the second barrier, which is only three quarters of a mile upstream, is a reservoir spillway. The reservoir was constructed in the 1960’s, and at the time was specifically designed to provide fish passage. Unfortunately, stream conditions changed over time and the depth of the channel became greater, creating a total barrier to fish. 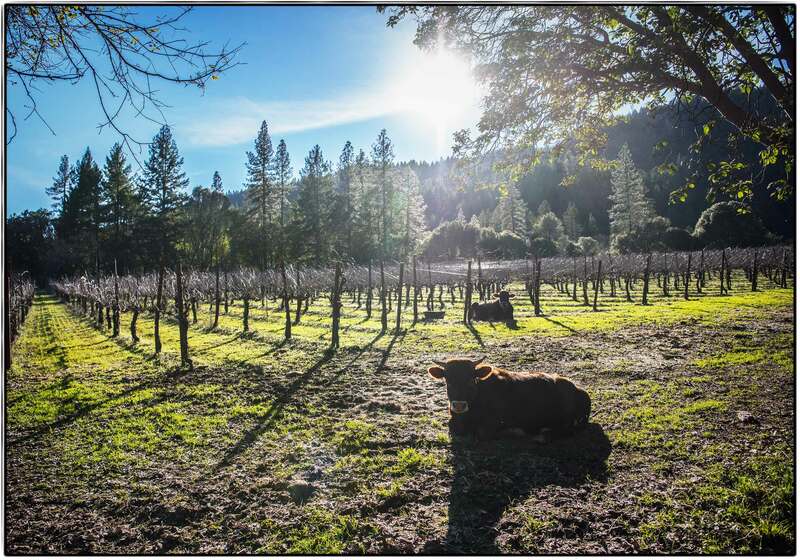 Frey Vineyards and their neighbor Cathy Monroe of the Easterbrook Ranch have been enthusiastic proponents of restoring steelhead to Mariposa Creek. This neighborhood-led, voluntary restoration effort began in 2001 and now is gaining momentum due to the collaborative efforts of several interested stakeholders. 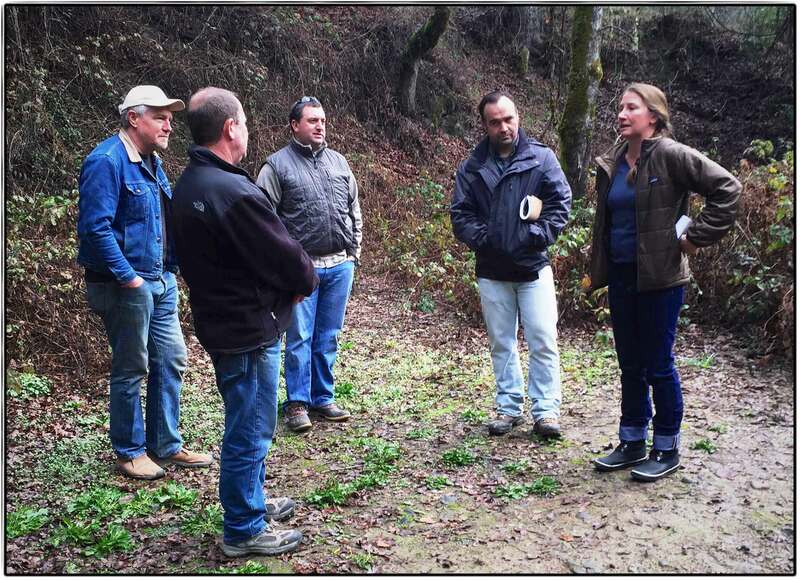 Thanks to the efforts of Frey Vineyards and Cathy Monroe, and with the help of their agent, North Coast Resource Management, Trout Unlimited, National Oceanic Atmospheric Administration (NOAA), and the County of Mendocino, a high priority salmon stream has entered into a preliminary design phase for exploring fisheries restoration options. Funding for this preliminary design phase of the project was provided by the NOAA Habitat Blueprint Program which is a strategic program that aims to integrate habitat conservation into existing agency programs by focusing efforts on priority areas, like the Russian River watershed. The program intends to increase the effectiveness of NOAA efforts to improve habitat conditions for fisheries along with other economic, cultural, and environmental benefits our society needs and enjoys. 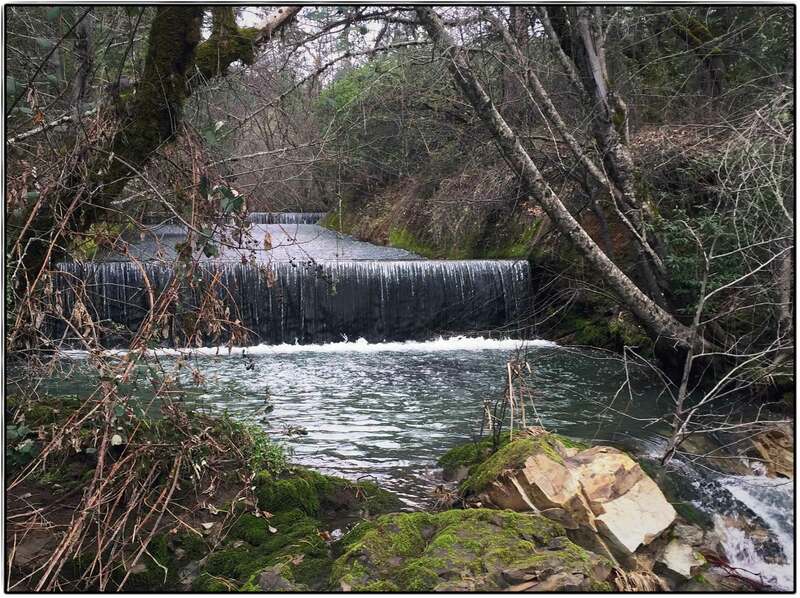 The preliminary designs will help the stakeholders explore the available options for restoration for both the on-stream reservoir and the county road culvert on Mariposa Creek. The project stakeholders will evaluate each option and then collaboratively select the best alternative that will achieve multiple benefits for fish, wildlife, and the surrounding community. Future phases of the project will most likely rely on securing grant funds in order to complete engineered designs and eventually construction activities. 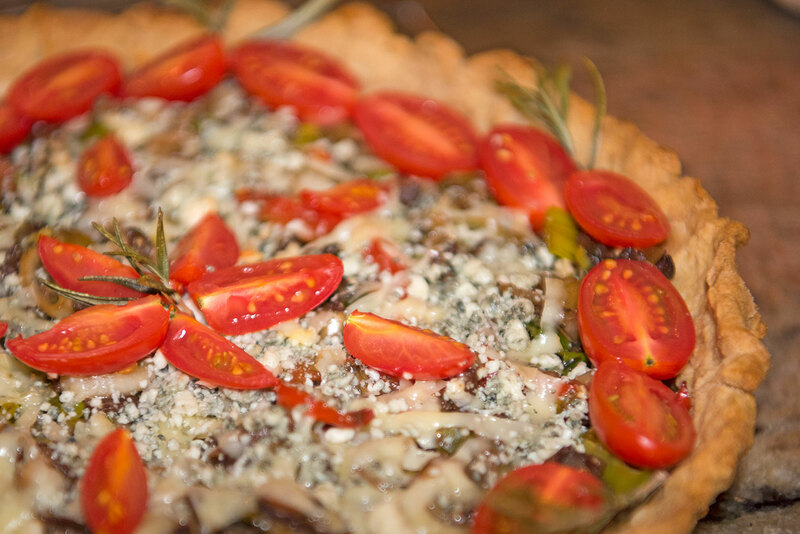 We enjoy this family favorite with roasted root vegetables and a farm fresh garden salad. This dish pairs nicely with Pinot Noir due to the earthy flavors of the nuts, dried berries, and root vegetables. 1.) Bring 2 cups of water and sugar to boil in small saucepan over medium-high heat. Stir in orange zest and carrots, simmer until carrots are tender, 12-15 minutes. Drain and allow to cool on a plate. 2.) Heat olive oil in a large saucepan over medium heat. Add the onion and 1 ½ teaspoons salt and cook until the onion is softened, about 5 minutes. Stir in saffron and cardamom and cook until fragrant, about 1 minute. Stir in rice, and cook for about 3 minutes or until the edges begin to turn translucent. Stir in 2 ¼ cups water and bring to a simmer. Reduce to low, cover, an simmer until liquid is absorbed and rice is tender, 18-20 minutes. 3.) Remove pot from heat and sprinkle candied carrots and orange zest, cranberries, and currants over rice. Place clean, dry dish towel over pot and return the lid to the pot with the towel underneath. Allow to stand for 10 minutes. Add almonds and pistachios and gently fluff with fork. Season with salt and pepper to taste. One of my favorite dishes is a tomato tart that I learned at the California Culinary Academy so many years ago (don’t ask how many!). In this new dish tomatoes get demoted to the role of garnish and, just in time for autumn, mushrooms and leeks take the leading role! It paired nicely with Frey Organic Syrah, which I also used for the sauté. In a sauce pan, sauté the leeks, red peppers, garlic, cremini mushrooms and shitake mushrooms, the stick of butter and herbes de Provence until done. Season with salt and pepper. Set aside. Place the dry porcini mushrooms in a saucepan with the Frey Organic Syrah red wine and the honey. Simmer for about 15 minutes until the wine is reduced and thickened. 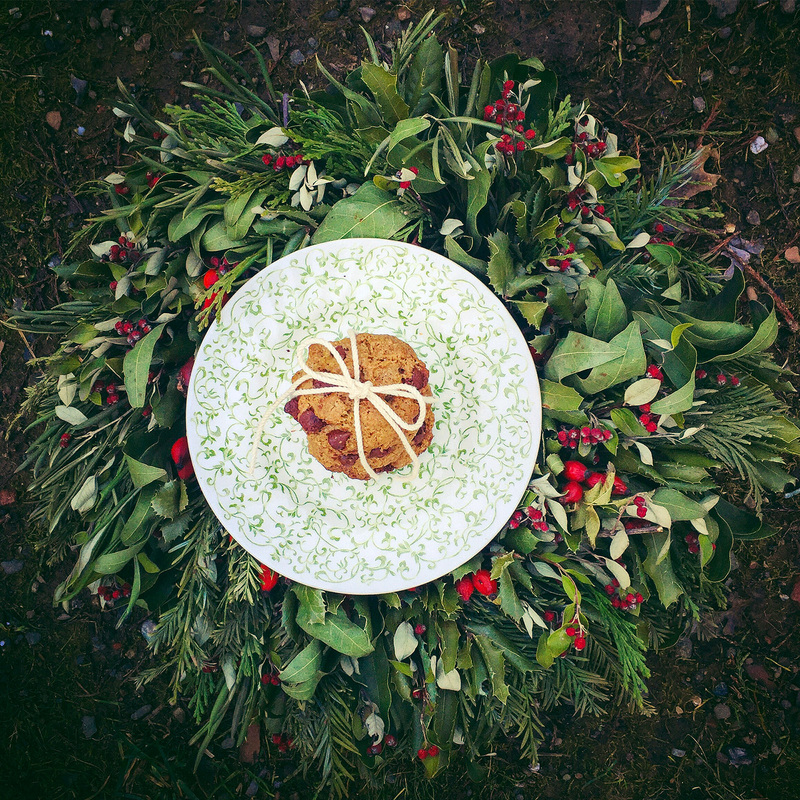 Place the whole-wheat pastry flour, cold chopped butter, fresh chopped rosemary and salt into a Cuisinart, or use a mixing bowl. If you have a Cuisinart, use the blade and pulse it a few times until the butter is the size of peas. Slowly add the cold water or ice water until the dough is not too dry, not too wet. If you’re using a bowl, rub the flour, butter, etc., between your hands until the butter is the size of peas. Add very cold water or ice water until dough not too dry, not too wet. Now whip out the rolling pin! Roll half the dough on a floured surface to about ¼ inch thick. 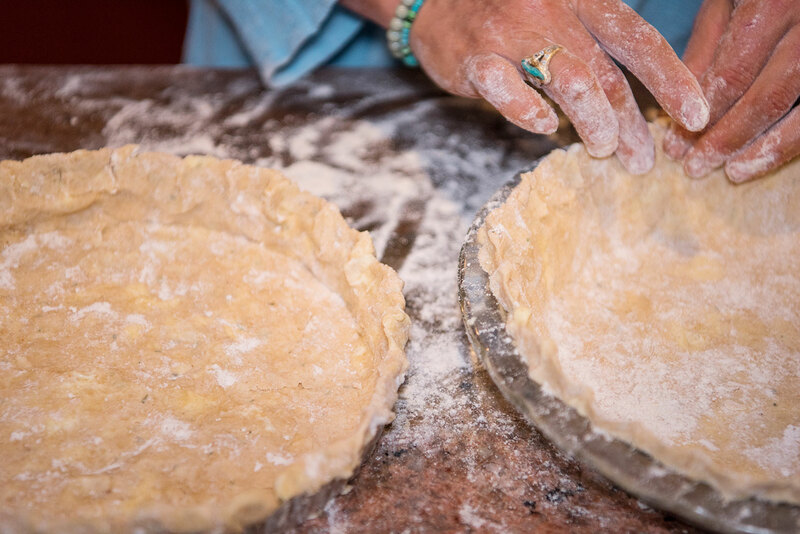 Make it a circle just over the width of your tart pan or pie pan, so you have plenty to fit up the side and for crimping. Now let’s get the rolled dough into the tart pan. 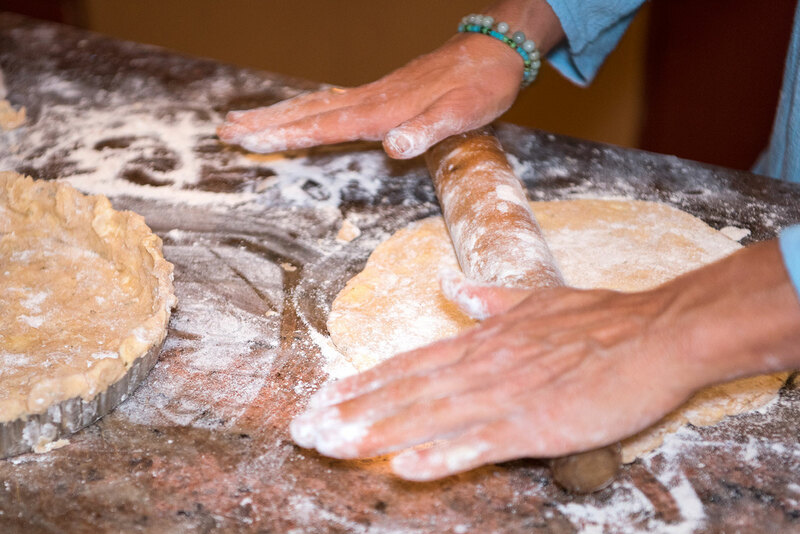 With tart pan nearby, gently roll-up the dough around the rolling pin. Lightly sprinkle with more flour as needed, so that the dough doesn’t stick to everything. Unroll the dough onto your tart pan. You can also fold the dough in quarters before lifting it to the tart pan. Pinch and prod your dough until it fits nicely into the pan. Cut the dough sides flush with the edge. Note: You could buy pre-made pie crusts at the supermarket. But don’t be intimidated by making the dough yourself. Have a culinary adventure! You’ll enjoy the dish that much more when you make it fresh and nothing like taking a little risk in the kitchen to make everything taste better. Gently lay a piece of tin foil over the crust and carefully form it into the shape of the crust (up the sides and a little bit over the edges). Cover the bottom with a single layer of raw beans. This weighs down your dough as it cooks. Bake the tart shells at 350F. After baking 15 minutes gently lift off the foil with the beans in it. (The beans are still good for another day.) Cook another 10 to 15 minutes or until the tart shells are golden brown. Remove from oven and cool for 10 minutes. Paint the bottom of the baked tart shells with the mustard and sprinkle with a third of the grated Gruyere cheese. Mix another third of the grated Gruyere cheese, along with the crumbled Gorgonzola cheese, into the mushroom and leek filling. Then distribute the filling evenly between the two tarts. Arrange the cherry tomato-halves in an attractive pattern on top and sprinkle with the remainder of the grated Gruyere. Add a few sprigs of rosemary for a final touch. Bake the tarts in the oven, still at 350F, for 15 to 20 minutes, or until the tart is hot and the cheese melted. Remove from the oven and serve immediately. Bon appetite! Chef Tamara rolling the pie dough. 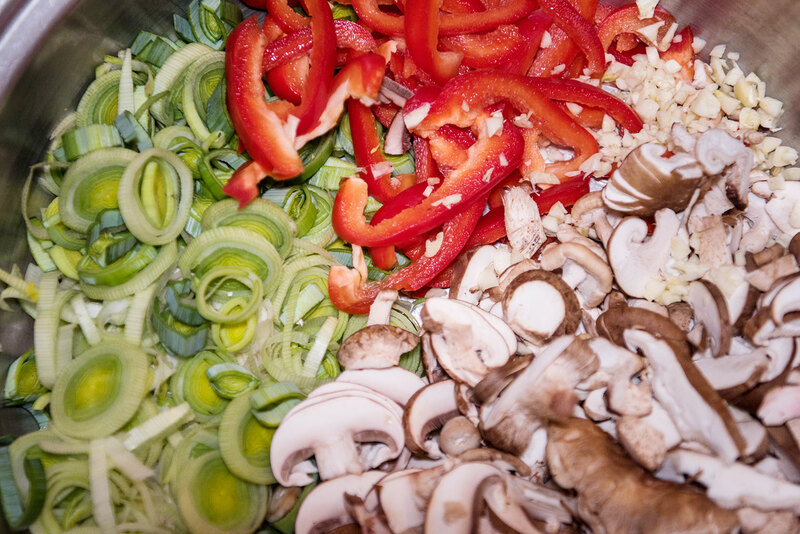 Chopped veggies, ready to sauté! • Heat the oven to 350 degrees. • Heat 1/4 cup of olive oil in a large oven-proof skillet over medium heat. • Remove the skillet from the heat, add crushed garlic and bread and mix well. • Transfer skillet to the oven and bake for 15 minutes until the bread is golden brown. Let it cool down. • In the meantime, prepare the tomatoes. Cut the cherry tomatoes in half, and core and slice the large tomatoes into medium cubes. • In a large bowl, mix tomatoes, cucumbers and onions. • Combine vinegar with remaining olive oil, salt and pepper and pour over the salad. Mix well. • Add toasted bread and basil, and toss everything together. 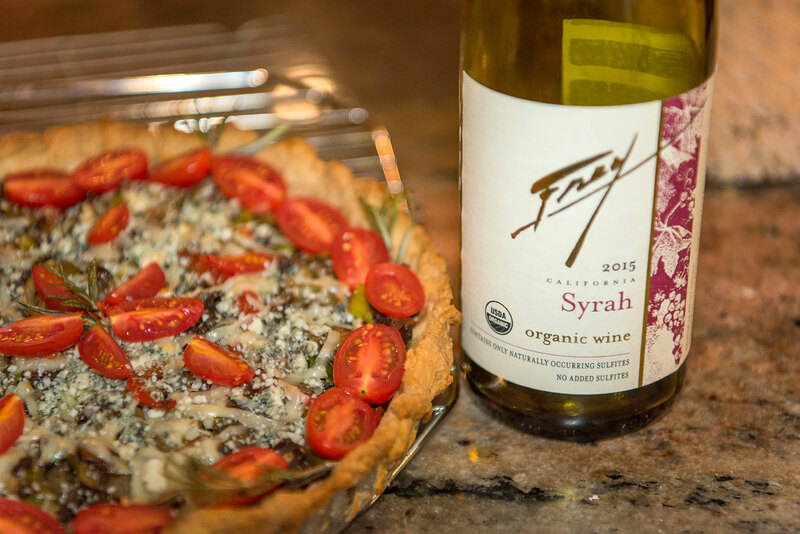 • Enjoy with a glass of Frey Organic Pinot Grigio! 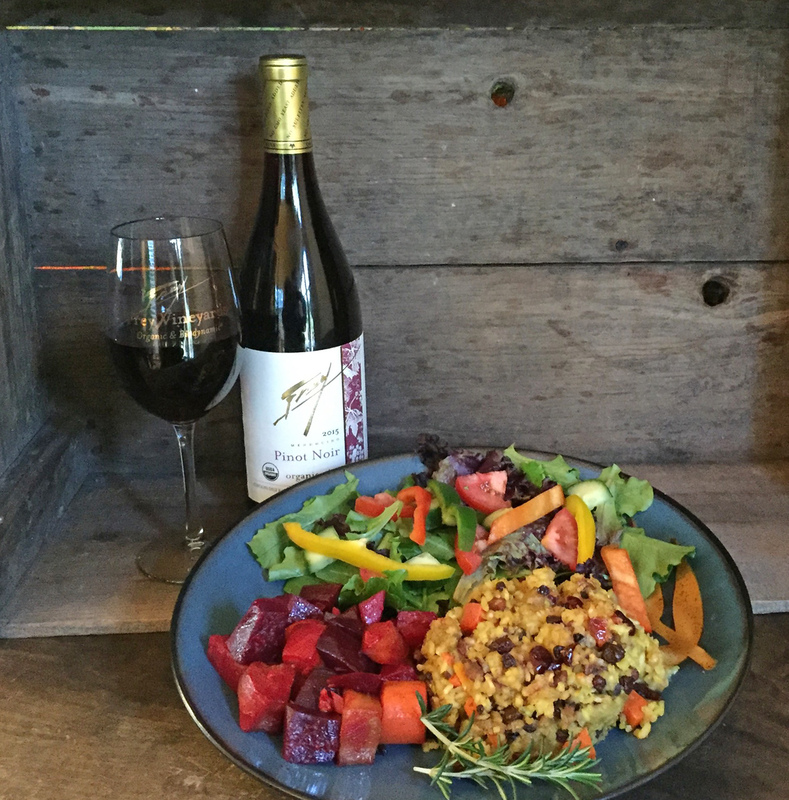 Our in-house chef Tamara Frey especially created this dish for our Organic Wine Club members. Copyrighted 2016, Tamara Frey. 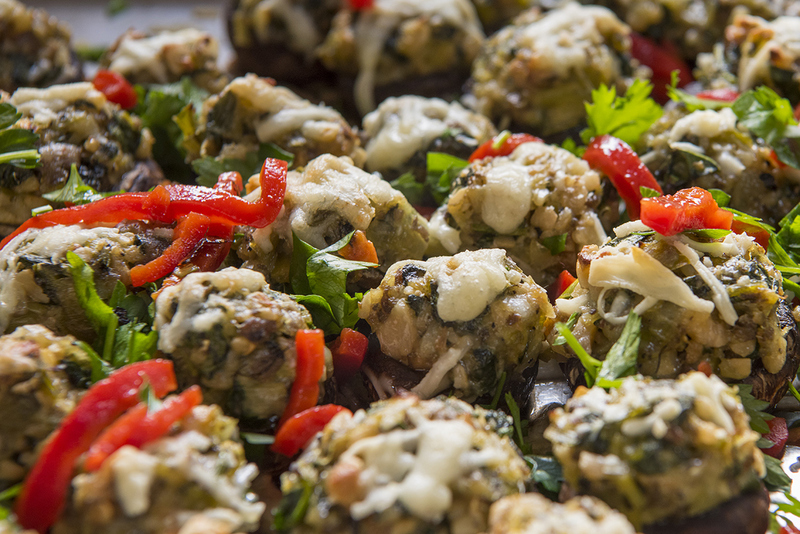 Spinach stuffed mushrooms are a longtime favorite of mine and are delicious served with a crisp, cold glass of Frey Organic Sauvignon Blanc. This tasty appetizer serves about seven people. -Break off the mushroom stems, set aside the tops. Chop the stems fine, or blend them in a Cuisinart until coarsely ground. -Place in a bowl and add the finely chopped leek, garlic, and mint. -Pre-heat the oven to 250 degrees. Spread the raw cashews on a baking pan, roast them approx. ½ hour to 40 minutes until nice and toasty. Then blend in Cuisinart to medium coarse crumbs (not pulverized, but not too large either). Set aside. -Place the Frey Organic Sauvignon Blanc and honey in a saucepan, simmer approx. 15 to 20 minutes until reduced approx. by half. -In another pan, heat the oil (or butter) and sauté the leeks, garlic, coarsely ground mushroom stems, and mint, until sweated and done. Deglaze it with the reduced Sauvignon Blanc. Sauté a bit until not too wet. Then add the grated cheese (but set aside ¼ cup of the grated cheese for garnish), add the chopped spinach and cashew crumbs. Heat a few seconds more, just enough for the spinach to cook and for the cheese to melt to act as a bonding agent. -Mix all together and season to taste with the salt, black pepper and cayenne. Stuff the raw mushroom tops. (I like to do this by first rolling the mixture together into balls just under the size of the mushroom top, like rolling meatballs. Then I stuff the tops as high as possible, like little mountains) and place them on a baking pan. If there’s stuffing left over, enjoy by the spoonful as the mushrooms bake! -Sprinkle on the remaining Parmesan or Asiago cheese and bake the stuffed mushrooms in a 350 degree oven for approx. fifteen minutes, or until they are soft when squeezed. Garnish with the slivered roasted red peppers and the chopped parsley. Guest Chef: Sitarani Palomar of "An Organic Conversation"
Sitarani Palomar, co-host of "An Organic Conversation" made this delicious soup for us served with an arugula salad with beluga lentils at a recent organic food event. Preheat oven to 300 degrees F. Core and quarter the tomatoes and set aside. Heat a large saucepan over medium heat. Add the olive oil and when warmed, add the garlic, sautéing until golden, but not browned. Add the sliced onions, sea salt, and black pepper, and sauté until onions begin to soften. Add ¼ cup of white wine and saffron, and simmer until the wine cooks off, about 10 minutes. Remove from heat add tomatoes, and then divide the ingredients between high-sided sheet trays or casserole dishes. Place in oven and roast for 1 hour. 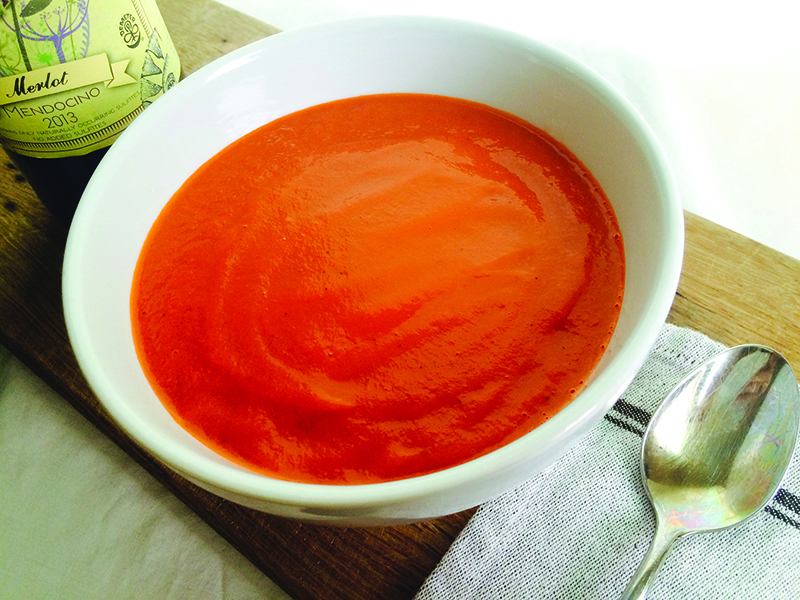 Remove roasted tomatoes, garlic and onion from the oven and deglaze with the remaining ¼ cup of wine, stirring to dissolve as much of the browned ingredients as possible. Transfer all vegetables and juices to a high-speed blender with vegetable stock or water. Purée until smooth, and pour back into the larger saucepan. Bring to a boil, reduce to simmer, and simmer for 15 minutes, or until desired consistency is reached and flavors have melded. Season with additional salt and pepper to taste. 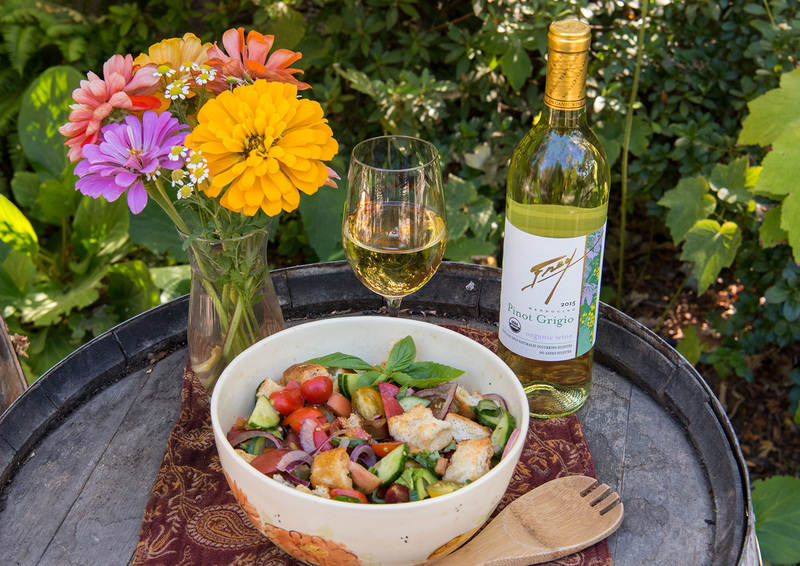 Pairs perfectly with Frey Vineyards 2014 Biodynamic Chardonnay at lunch for its balanced acidity and complementary depth from light oak flavor. 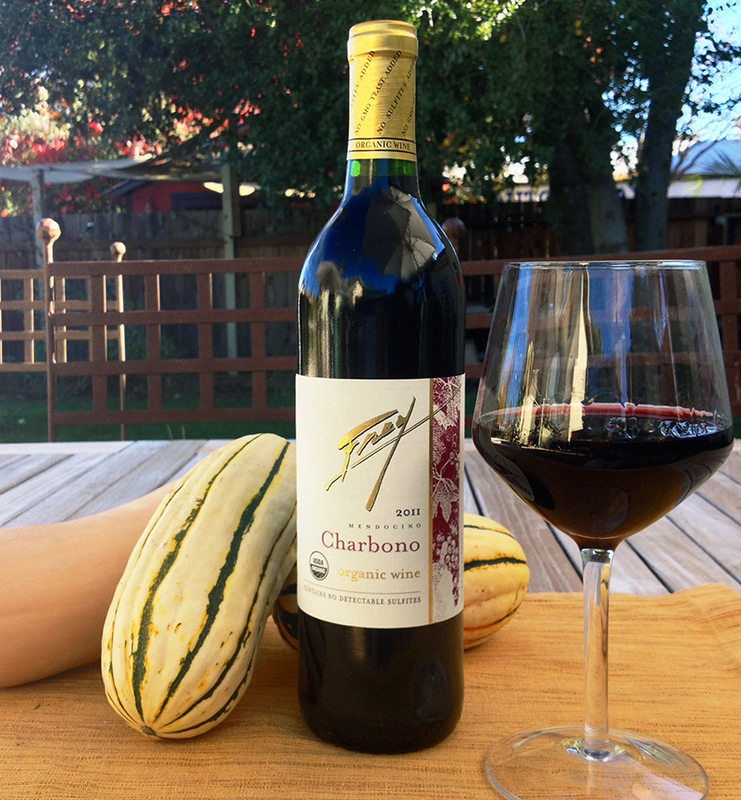 Alternatively, enjoy with the velvety richness of Frey Vineyards 2014 Organic Merlot for a satisfying dinner. Serves 4.